Brocade now offers two SDN certification credentials focused on its virtual router product platform. Here's what you need to know. These days, the same is very much true for SDN, because just a handful of companies actually offer products to implement SDN; however, nearly every company involved in networking (including both established players and a veritable raft of startups) has an SDN story to tell. This same phenomenon goes double for SDN-related certification credentials, which include companies ranging from Cisco and Juniper to HP and IBM. They may talk about producing credentials in this area, but none have any credentials available to learn and earn at the moment. The sole exception I can find right now is Brocade, whose purchase of Vyatta in November of 2012 brought a cert credential for the company's virtual router product to go along with it. Right now, in fact, Brocade offers two SDN certification credentials focused on this platform, with more in development to segue into the company's existing curriculum and certification paths (see the company's Brocade Ethernet Fabric and Converged Path for a likely place for these credentials to drop in). Brocade Certified vRouter Engineer 2013 (BCVRE): This includes basic understanding of installing, configuring and troubleshooting features of the Brocade Vyatta Network OS. It requires taking and passing a single exam ($150, 170-010, available from Pearson VUE). Numerous Web-based training (WBT) courses are available to teach the product and cover installation; CLI; dynamic addressing and DNS; DHCP, Ethernet and VLAN configuration; static routes and OSPF basics; NAT; firewall; and management and logging features. Brocade Certified vRouter Professional 2013 (BCVRP): This focuses on more advanced topics related to installing, configuring and troubleshooting features of the Brocade Vyatta Network OS. It also requires taking and passing a single exam ($150, 170-110, available from Pearson VUE). Though the cert page doesn't mention the BCVRE as a prerequisite, it looks like the WBT courses for this credential presume successful completion of those courses as well. They include multi-area OSPF, BGP (basics, policies, tuning, route redistribution and multicast routing), site-to-site VPNs (IPsec and OpenVPN), remote access VPNs (OpenVPN), plus high availability, load balancing and QoS. I did a double-take at first when looking over these credentials because I'm more used to seeing "engineer" as the higher-level designation and "professional" as the lower-level designation when there's a progression on the same platform or technology. Brocade reverses this typical order, but it's clear from the curriculum elements for these two credentials that in this case, "professional" trumps "engineer." I spoke to Joe Cannata, Brocade's Senior Manager of Certification, late last year to learn more about the former Vyatta credentials. He indicated that Brocade University's course development staff gave this curriculum a thorough once-over and brought its materials completely up to spec with the rest of the Brocade training and cert offerings (which generally garner high praise from cert candidates, partners and hiring organizations alike). Furthermore, the former Vyatta Certified Professional (now the BCVRP) was supplemented by the lower-level BVCRE to provide IT professionals with a gentler entry point into the company's vRouter product line. Figure 1. 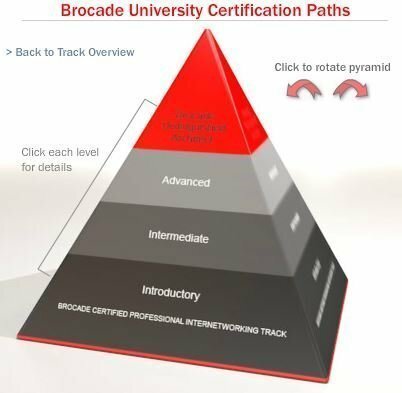 Brocade uses the pyramid model to distinguish cert ladder tiers. When Vyatta announced its cert program in June 2012, the company made mention of an expert-level credential as well. So far, there's no sign of such from Brocade, nor would Mr. Cannata comment as to whether such an item might appear anytime soon, or if it would map into the company's Advanced or Distinguished Architect certification levels, as shown in the pyramid diagram (Figure 1). Missing in depiction: vRouter (BCVRE and BCVRP) on brocade curriculum paths? If you look over the various Brocade University curriculum paths that the company makes available for SAN, IP Layer 2/3, IP Layer 4/7 and its Ethernet Fabric offerings, neither of the vRouter/SDN credentials make it into any of those course and credential mappings. To me, this speaks to issues that many cert sponsors considering or building SDN credentials and training must also be facing -- namely, the boundary-smashing characteristics of what SDN is and does. For example, you could find elements of SDN in several of the existing curriculum paths, but none of those paths truly embrace the entirety of what the BCVRP and BCVRE certifications cover. My best guess is that Brocade will probably have to create a new category for SDN topics and think about housing virtual infrastructure (VDX software elements) and the vRouter products in their own curriculum path. This will mean a significant reworking of their current curriculum elements and the paths that tie them together, not unlike what happens to networks when virtualization turns boxes into programs and separates the control plane -- not to mention, network links and management from the devices and physical connections that tie them together. It should be instructive to watch what Brocade does, because they're leading the way into a whole new realm of networking (and related training and certification). Ed Tittel is a 30-plus-year IT veteran who's worked as a developer, networking consultant, technical trainer, writer and expert witness. Perhaps best known for creating the Exam Cram series, Ed has contributed to over 100 books on many computing topics, including titles on information security, Windows OSes and HTML. Ed also blogs regularly for Tech Target (IT Career Jump Start, Windows Enterprise Desktop), Tom's IT Pro and PearsonITCertification.com.